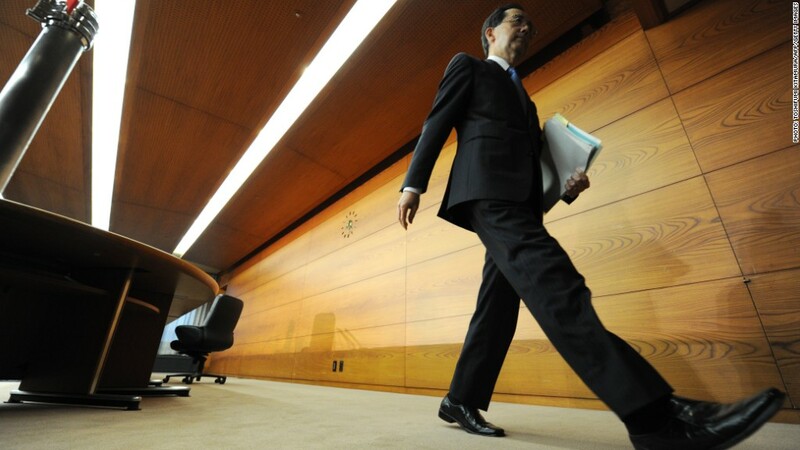 Masaaki Shirakawa is stepping down as Bank of Japan governor. Shinzo Abe has his man at the Bank of Japan. Now the hard work begins. Elected prime minister for a second time in December, Abe has argued forcefully that the central bank is not moving quickly enough to stimulate Japan's flagging economy. He favors aggressive monetary easing, and made that the centerpiece of his election campaign. The idea is that further easing, combined with fiscal stimulus, could end years of deflation and coax the world's third largest economy out of recession. The strategy got a boost Thursday as Abe nominated Haruhiko Kuroda to succeed Masaaki Shirakawa as Japan's top central banker. Kuroda has deep ties within the international finance community. He has been a vocal critic of the central bank's timidity, and his policy prescriptions largely mirror those of Abe. The yen has weakened significantly, falling 20% against the U.S. dollar since the beginning of October. The Nikkei has been on a tear, adding more than 30% since the middle of November. But what more can the Bank of Japan and its new governor do? And will markets be satisfied? Interest rates, a central bank's main tool, are already very low. And Shirakawa has already set a new inflation target of 2%. "A closer look at Kuroda's policy options suggests that the markets' expectations of much more aggressive easing are likely to be disappointed," Julian Jessop at Capital Economics wrote in a research note. Kuroda favors setting a deadline to achieve the inflation target, perhaps within two years. It's a policy that markets will cheer in the short term, but the impact may pale compared with the setting of the higher 2% target in the first place. Kuroda could also push the bank towards expanding its asset purchase program. It's already buying short-term debt, and could expand its balance sheet by buying more exotic assets or foreign currency bonds. But those strategies might have a limited impact as the central bank has already increased its bond-buying program several times, while both Kuroda and Abe have balked at the prospect of buying foreign currency bonds - a move which would almost certainly bring renewed accusations that Japan is triggering a currency war. "We think the most likely changes under Kuroda would be a further increase in [Japanese government bond] purchases and a lengthening of their maturity," Jessop wrote. "This may not be much different from what Shirakawa would have done and would still fall well short of the easing currently planned in the U.S."
Some analysts fear that investors are bound to feel like the bank's actions aren't living up to Abe's rhetoric. 'Some of the more radical options, including purchases of foreign bonds and a two-year horizon for the inflation target, are unlikely to gain sufficient support, all of which is setting up the markets for some major disappointment," Jessop said. Others argue Japan has to try something. "From a global point of view, is it good for the Japanese economy to continue to suffer from deflation ... and low growth?" Kuroda asked during an interview with the Wall Street Journal earlier this month. "That is not good for Japan, not good for the world economy."